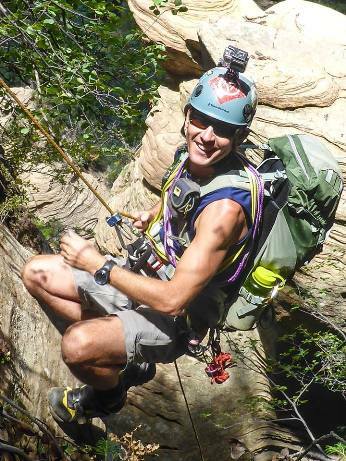 AWC’s accelerated one-day stewardship training program, held in July, encouraged Scottsdale resident Matt Kalina to go solo in the Arizona wilderness to monitor ecological and recreational conditions. “Now I know how to calculate human impact, eyeball noxious weeds and identify illegal campsites in the wilderness,” says Kalina, the first Arizona Wilderness Coalition steward to be assigned to a wilderness that includes a federally designated Wild and Scenic River—Fossil Creek, within Fossil Springs Wilderness. Kalina, a long-distance trail runner and technical canyoneer, was one of 30 volunteers who completed AWC's stewardship training on July 13. AWC’s comprehensive Wild Stew training is jam-packed with lesson units ranging from wilderness ethics, field awareness preparation and first aid to invasive species identification and recreational impact and field monitoring. The training is designed to prepare individual wilderness stewards to trek solo into wilderness areas, monitor conditions, collect data and submit their findings to the Arizona Wilderness Coalition staff, who incorporate it into recommendations for the U.S. Forest Service. The data is used to help the Forest Service improve management decisions, enhance ecological health, and maintain the wilderness character of each area. Sam Frank, director of AWC’s Wild Stew program, encouraged Kalina to take up an assignment in the 11,550-acre Fossil Springs Wilderness near Strawberry, Ariz., known as the most diverse riparian area in the state. The constant 72-degree waters of Fossil Creek flow at up to 20,000 gallons a minute from springs at the bottom of a 1,600-foot deep canyon on the Mogollon Rim. The calcium carbonate-laden and dissolved carbon dioxide waters deposit travertine, encasing everything in the stream, forming the fossils for which the area is named. The warm-water stream system is the fourth-largest producer of calcium carbonate in the United States. The watershed provides critical habitat for native fish and threatened species, including the Chiracahua leopard frog and Southwestern willow flycatcher. Kalina became a supporter of the Fossil Creek Stakeholders Conservation Group, established in 2007, after witnessing what he calls “revoltingly deplorable conditions” in Fossil Creek Wilderness in 2009, the year Congress designated the restored Fossil Creek as a Wild and Scenic River, as part of the Omnibus Public Lands Management Act. After the Arizona Public Service decommissioned an old hydroelectric dam, restoring the stream's natural flow in 2005, word quickly spread of the unique beauty of Fossil Creek, opening the floodgates of tens of thousands of recreationists who poured into the wilderness—a two-hour drive from Phoenix. Following outcry from a diverse groups of people who rallied to protect the wilderness, the U.S. Forest Service implemented measures to restore the area, adding camping restrictions in 2010, closing parts of Forest Road 708–Fossil Creek Road–to prevent traffic jams, prohibiting campfires in sensitive areas, rehabilitating some former campsites, and setting up portable toilets. It also began developing a management plan, which was scheduled for completion last year. Training through the Arizona Wilderness Coalition provides a knowledge base for stewards like Kalina to monitor conditions of wilderness areas like Fossil Springs. “Now I can use a standardized, structured way to document human impact and make a difference in helping protect and restore Fossil Creek, one of only two federally protected Wild and Scenic Rivers in Arizona,” he said. The other federally protected river in Arizona is the lower segment of the Verde River, designated in as part of the Arizona Wilderness Act of 1984. AWC is currently part of a large regional collaboration to protect the Upper Verde as Arizona’s third Wild and Scenic River segment. Kalina grew up in west central Wisconsin where he paddled numerous rivers, including the Lower St. Croix, designated as the first Wild and Scenic River in 1972. Carrying canoes and gear on 1,000-rod portages and overcoming sustained winds while paddling in the Boundary Waters Canoe Area Wilderness in northern Minnesota became a late-summer family tradition. He had his first taste of the wide-open splendor of the West as a teenager during a road trip his family took in a station wagon to the Badlands and Black Hills of South Dakota, and completed his first conservation work at 15 in the Youth Conservation Corps, a federally managed summer work program in Northern Kettle Morraine State Forest, Wisconsin. Kalina is a founding board member of Friends of Sonoran Desert National Monument, and helped establish the volunteer organization to protect the the Monument, designated by President Bill Clinton in 2001; the monument set aside 496,337 acres of spectacular Sonoran cactus plains and mountains southwest of Phoenix. Kalina is a member of the Arizona Mountaineering Club and of the Mountain Bike Patrol Team for the McDowell Sonoran Conservancy in Scottsdale, and has led more than 30 hikes in Arizona wilderness areas as an assistant organizer for Arizona Hikers and Off-Trail Explorers, based in Phoenix. He is more than one-third of the way through a quest to hike the 100 most-prominent peaks in Arizona, many of them in wilderness areas. Matt and his wife, Lisa, explore remote areas of Grand Canyon National Park and run marathons together. They live with two rescued cats in south Scottsdale. Photos: Top, Matt explores Immaculate Canyon within Red Rock-Secret Mountain Wilderness, courtesy Matt Kalina. Middle, Fossil Creek is a draw for water lovers from all over the West, copyright Nick Berezenko (nickbe@q.com). Bottom, Matt and his wife Lisa explore the confluence of the Little Colorado River and the Colorado River, near Grand Canyon, courtesy Tanner Beamer.